This IBM Redbooks publication is intended for those familiar with most of the IBM-provided iSeries performance tools that are generally available through the i5/OS operating systems commands and iSeries Navigator interfaces and the additional-cost Performance Tools for iSeries, 5722-PT1, licensed program. iDoctor for iSeries is a set of software performance analysis tools and associated services that extend your ability to evaluate the health of your iSeries-based system by gathering detailed information and providing automated, graphical analysis of this data. One of these tools, Job Watcher, is the key next-step advanced tool for analyzing detailed performance data. 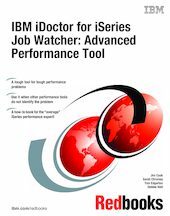 - Gives an overview of Job Watcher and most other IBM-provided iSeries performance measurement and management tools. - Describes the components of performance and how Job Watcher provides access to detailed performance data. - Provides examples of Job Watcher functions and its GUI in three applications: traditional RPG, SQL, and Java. - Provides Job Watcher collected data file and field definitions, and SQL query examples of this data beyond Job Watcher's array of graphical reports and drill-down information. This book's objective is to enhance the performance analyst’s proficiency in using Job Watcher as a key tool in the performance analysis tool kit.